The Latin cross emoji depicts what is also known as the Christian cross, the most common symbol of Christian iconography. The Latin, or Christian cross, has an elongated vertical arm and a shorter horizontal arm. It's used when someone wants to make a Christian religious reference. ✝️ Show God your faith and He will show you His faithfulness. A Latin cross emoji was approved as part of Unicode 1.1 way back in 1993 and added to Emoji 1.0 in 2015. It’s depicted on most platforms as a simple cross form on a purple or pink background, though some, like Samsung and Facebook, simply show the cross on a white background. The cross is meant to evoke the crucifixion of Jesus. It’s used by people who are referencing their faith or their church and by people who are simply referencing Jesus or religion in many different contexts. It can also be used to indicate prayer or spirituality in a post or message. 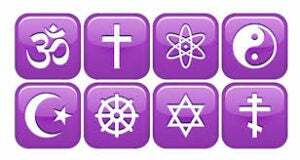 But, it’s not the only religious emoji … Unicode also includes other generic symbols, like the cross, that represent some of the world’s other religions, such as the Om symbol. There are many instances where using the Latin cross emoji is desirable. A message might be serious, sobering, and heartfelt, or it might be one of joy, discovery, or occasionally just a whimsical bit of humor. It might be used in a discussion of religion, alongside other emojis such as the Jewish Star of David or the Islamic star and crescent, for example. The emoji is often used when people have a need for prayer or when they are expressing love or remembrance of someone who has passed on. It’s used when they see the glory of God in something they love, and, yes, it could be football! People also use it to affirm and express their own deeply felt beliefs. If God could close the mouths of lions for Daniel, part the red seas for Moses, make the sun stand still for Joshua, open the prison for Peter, put a baby in the arms of Sarah, and raise Lazarus from the dead THEN He can certainly take care of you. NOTHING is too big for Him.